Defending champion Juan Martin del Potro has withdrawn from next week's Indian Wells event with a knee injury. Del Potro played his first tournament since fracturing his kneecap in October at last week's Delray Beach Open. The Argentine world number four, 30, says he now needs "regenerative therapy treatment". 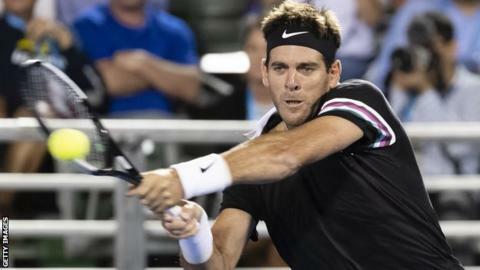 "Unfortunately, I will have to wait for several days before I can get back on court and train," Del Potro said in a statement posted on Twitter. The 28-year-old won 6-4-6-4 in one hour 37 minutes and will face Colombia's Santiago Giraldo next.